2014 is right around the corner and in the fitness / gym business its your busy time of year or should be. If you are looking for additional certification for your trainers and marketing push for your business Xtreme Couture can help! We offer exclusive territory, marketing templates, video training clips, lesson plans created by mma legend, Randy Couture. See how we can help and learn more by visiting our Affiliate site. 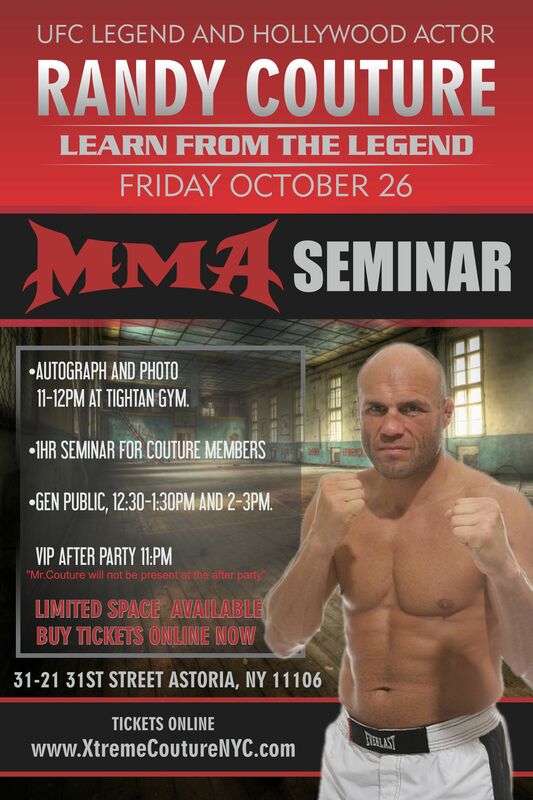 Xtreme Couture MMA (http://www.xtremecouturemma.com/) and Randy Couture are excited to announce two MMA Seminars at our affiliate gym (Tightan MMA Fitness Club) in New York on Friday October 26th, 2012. The Natural – Randy Couture will lead a group of MMA enthusiasts showing them hands on his winning techniques that brought him to legend status in the UFC and earned him six UFC titles. This is a limited engagement and space is limited to please pre-register and don’t miss out on an opportunity of a lifetime to learn from an MMA legend – Randy Couture. There will be 3 days of instruction focusing on Submission Grappling, Striking, Muay Thai and Wrestling as they apply to MMA. Randy will talk to the group about mental skills, nutrition as well as an autograph signing and photo session on Sunday to wrap up the camp. All sessions will be followed by a Q&A session. Spectators are not allowed to watch, film or take photos during the camp. The Xtreme Camp is open to people of all skill levels ages 15 and up. • This is a No-Gi training camp • Fight shorts, a cup, a mouthpiece, shin pads, boxing gloves, hand wraps and MMA gloves are required or can be purchased. Due to the high demand of these camps all cancellation requests must be at least 2 weeks prior to event. If you cancel within the 2 week window you will be charged 50% of the camp fee, less than a week notice will be charged 75% of the camp fee, sorry no exceptions. Mixed Martial Arts (MMA) Icon Randy Couture’s Xtreme Couture MMA training center is proud to announce their newest initiative, the Xtreme Couture MMA Affiliate program as well as to announce the first training center, Tightan Gym MMA & Fitness Club . The first training center to receive certification is Tightan Gym MMA & Fitness Club located at 31-21, 31st Street, Astoria, NY. Owner and operator of Tightan Gym MMA & Fitness Club, Jon Gallo stated of the Xtreme Couture MMA coach that visited his location “He was everything I expected and more; he spent a great deal of time evaluating the gym and instructors he seemed like he knew exactly what he was looking for” Jon Gallo went on to say “I am confident Tightan Gym will be an excellent example as the first Xtreme Couture MMA Affiliate”. 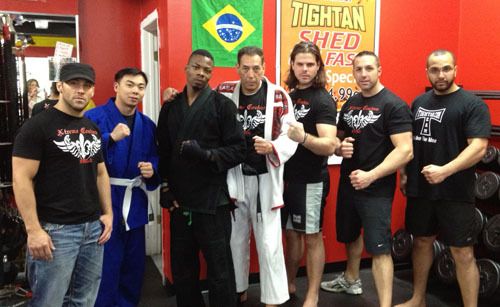 Tightan Gym MMA & Fitness Club is Queens’ largest MMA Fitness Facility offering a full unlimited class schedule with an array of classes and all the amenities of a state of the art gym. Tightan offers a semi cage, boxing ring and a complete cardio and weight room floor. Open 7 days a week and conveniently located between Broadway and 31st avenue. LAS VEGAS – Randy Couture has unveiled a new Xtreme Couture MMA Affiliate Program. Now for the first time existing gyms and training centers, no matter the size or location, have the opportunity to partner with a major brand get marketing muscle and best of all gain valuable training support and structure. The XC Affiliate Program is Randy Couture’s concept to continue to expand his proven MMA fighting style, coaching methodology, conditioning programs and nutritional philosophy to existing gyms and training centers. In turn these new affiliates will pass this on to their clientele. As an affiliate of Xtreme Couture they can take advantage of new branding, networking possibilities between locations, instructional support from corporate and new national media exposure that will help increase their businesses bottom line. XC Affiliate certification will be issued annually and each facility will be ranked accordingly by discipline and instructor experience (Level I, II, III). Special instructor certification (i.e. BJJ belt testing) will be also available at Xtreme Couture HQ throughout the year. In addition to our certification, XC Affiliates will have special training opportunities and seminars at Xtreme Couture HQ. XC Affiliates will also have the opportunity to increase sales by carrying official Xtreme Couture merchandise and XCAP Sport Supplements. Randy “the Natural” Couture is one of the greatest and most decorated MMA fighters in the world. His six separate UFC title reigns, spanning two weight classes gives him a resume that is unmatched in the sport. Randy has long been considered the ambassador of the sport and is also the 4th fighter to be inducted into the UFC Hall of Fame. Xtreme Couture MMA Fitness Centers are a reflection of that success. Founded in February 2007 by Randy Couture Xtreme Couture MMA has been a world renowned training center focusing on all Mixed Martial Arts training disciplines. (Boxing, Jiu-jitsu, Kickboxing, MMA, Submission Grappling and Wrestling). Top fighters call Xtreme Couture home like Martin Kampmann, Forrest Griffin, Amir Sadollah, Evan Dunham, Frank Trigg, Ray Sefo, Mike Pyle, Tyson Griffin, Jay Hieron and Michael Chandler. ATTENTION…..ATTENTION……ATTENTION….. CADETS and JUNIORS!!! and Seniors as well. As you may or may not know by now FILA postponed all Cadet and Junior Games for 2012. We have just learned these games have been rescheduled in April 2013 Guam and feature Cadet, Junior and Seniors for both Pankration and Combat Grappling! What this means is any athlete from age 15 on up will be eligible to compete in this event, however in order to qualify for this opportunity you must secure your eligibility by Competing in the 2012 US Team Trials which are being held March 31 and April 1, 2012 at Xtreme Couture MMA in Las Vegas. Although it is not currently scheduled, in the event Guam is able to secure Schoolboy(14-15) or Novice(12-13) for this event, you will also need to attend the 2012 trials. Less than two weeks left to register!! Don’t miss your chance to be part of this historic event. Those of you who participated in our 2011 US Team trials will be excited to know that as a result of our record number of competitors we have decided to split the competition over two days, with Saturday’s Competition focused on adult divisions and Sunday exclusively for the youth! In addition we will be featuring four FILA certified referees. Not only will you have a chance to meet members of the 2011 Silver Medal Team, you will also have the opportunity to meet your 2011 Gold Medal, World Champions, Laura Hill, Katie Maki, Kristen Palmejar, Michael Renteria, and Michael Smith. In addition, our Host, Randy Couture, has indicated that some of your favorite UFC fighters will be lurking around the gym both days! In addition, as a result of the growth of this sport on both a national and international level, we will be selecting a total of 28 adults to represent the country in the 2012 World Championships, with 8 men and 6 women competing in pankration, and 8 men and 6 women competing in the up and coming sport of Combat Grappling. Whether you’re looking for the opportunity to retain your title as the USA Champion, or to avenge a loss from last year, this is your opportunity to claim your place among the best athletes our Country has to offer!! Click on this link http://www.usafpa.org/Default.aspx?pageId=1181307&eventId=421419&EventViewMode=EventDetails or go to usafpa.org. 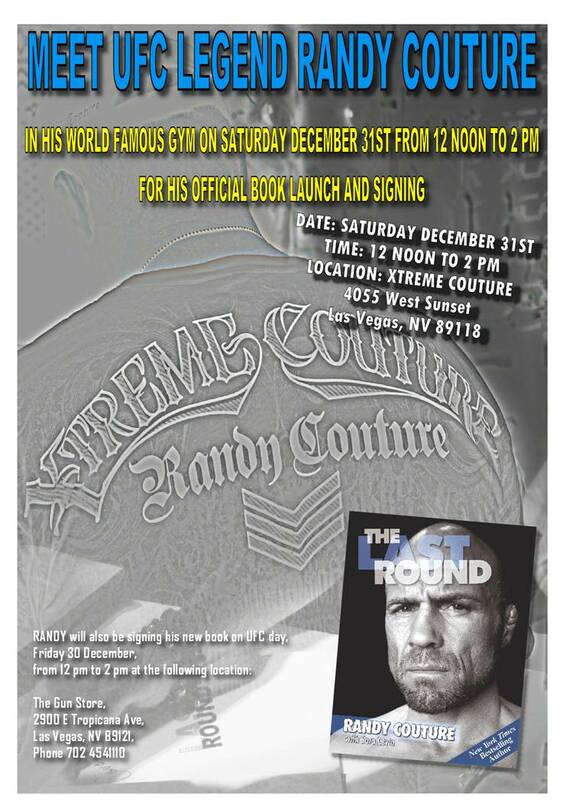 UFC hall of famer RANDY COUTURE, who has just returned home from a book launch tour in Europe, New York and St Louis, will be officially launching his new book THE LAST ROUND in his hometown of Las Vegas on December 30th and 31st. Couture has been filming in Bulgaria the sequel to THE EXPENDABLES with A-Class Hollywood stars such as Sylvester Stallone, Jason Statham and Bruce Willis. After hanging up his gloves earlier this year, “The Natural” has not slowed down with offers coming in from the movie industry and spending time with other business ventures such as launching his new supplements range XCAPS.